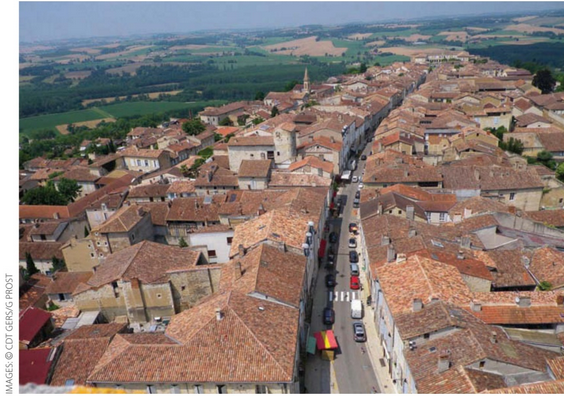 Equidistant between Auch and Agen, high above the Gers River, from which the département takes its name, sits the medieval town of Lectoure, surrounded by crops of sunflowers, wheat, linseed and melons, which reflect its agricultural roots. Lectoure's 3km of cream-coloured stone fortifications encircle medieval, Renaissance and 18th-century buildings. The narrow, ancient streets lead to shaded courtyards, above which precarious wrought iron galleries access tiny suspended gardens, while taller stone houses seemingly jostle over the spectacular Pyrénéean views southwards, and architectural gems sit discreetly behind majestic wooden porches, unseen by casual visitors. Locals with genuine Gers accents exchange pleasantries with gentrified Parisians during the weekly market, there are screams of support for the 'ORNI' (unidentified wheeled objects) racers during the annual Fete de Melon, and also pilgrims on the Sain Jacques de Compostella route heading for Spain via the iconic Chathédrale Saint-Gervais et Saint-Protais. There are night markets during summer, classical and jazz concerts in private courtyards and gardens, flea and antique marketsin the streets, and two consecutive nights of firework displays to rival any in the world. There are art festivals, photography, books and fairs featuring local crafts. Around Lectoure, magnificently restored properties and châteaux are offered for sale from €600,000 to €2m. Authentically restored historic houses in town are priced from €300,000, and cottage-style holiday homes start at €125,000. A major renovation project in the shape of an authentic, stone-built farm property with outbuildings and plenty of land, can be purchased from upwards of €100,000. Lectoure is favoured by a range of overseas property buyers - from Columbia to Jamaica, the Cotswolds to Brussels, and Amsterdam to the Congo. This international mix of first and second home-owners relax into the authentic small town, rural lifestyle. But it isn't a place for those in a hurry, in Lactoure, the chemist, chats, the butcher passes the time of day, and everyone asks how the family is getting on, wonders if there'll be another 25°C Christmas, and whether the town's spa treatment works for aching joints. There are no yachts, flashy cars (save for the annual parade of vintage voitures), nightclubs or 'Euro bling'. Lectoure is particularly well located for international residents - it's a 30-minute drive to the A62 Autoroute, linking Bordeaux and the Med. Airports are easily accessible at Toulouse, Bergerac, Pau (90 mins.) and bordeaux (120 mins. ), and there's the TGV train at Agen (30 mins. ), where the new LGV line will make Paris under 3 hours away. * With thanks to Lesley Spriggs, from our partner agency in Lectoure.